While it might be true that Joe Chiappetta's Silly Daddy was part of the burgeoning independent and alternative comics scene which burst into glorious and diverse life during the course of the last decade of the century past -- remember, this is the very same movement which gave rise to both Image Central and Oni Press, as well as such singular imprints as AAA Pop, Abstract Studio and Cartoon Books from Mike Allred, Terry Moore and Jeff Smith, respectively -- there was always something definitely, even defiantly, different about the look, the attitude and the presentation of Joe Chip's autobiographical masterwork in the making. Even stating that the series was essentially autobiography in nature could be seen as contentious, since the fact of the matter is that, while the book did hew to many of that particular genre's conventions -- including extended reveries, occasionally morbid introspection and highly personal, sometimes even excruciatingly painful revelations about the nature of the author -- it was just as likely to suddenly veer off into pure fantasy, simultaneously juxtaposing and skewering the social undercurrents of the then-current indy comics convention scene through the application of the conventions of the superhero genre, or perhaps suddenly jumping into the future while maintaining, and exploring, the mechanisms of memory and the autobiographical genre itself. Stuffy? Academic? Boring? Not on your, or anyone else's, life. In fact, these were some of the most vital, thought-provoking and simply human stories committed to paper in the past decade. And they pack just as much emotional power, perhaps even more, today -- a fact that a whole new generation and a wider audience is about to discover for themselves when Reed Graphica releases the definitive Silly Daddy featuring the "director's cut" of Joe Chip's loving and often lacerating sequential self portrait. Bill Baker: Joe, let's start with the obvious: Who is the daddy that the book's title refers to, and what makes him so darn silly? Joe Chiappetta: Well, it's autobiographical, so that would be me. And the silly part, it has a double meaning. Part of it is just the obvious; that, as the story begins, I'm a completely inexperienced father, and the things that I do are pretty ridiculous. Most of them are harmless, and so you get a lot of laughs out of that. And, actually, they are things that you don't tend to hear talking to other fathers. I don't know if some of these life experiences kind of go unnoticed as they happen to other fathers, or if it's the kind of stuff that no one has thought to capture. I think it's that. But that's the first part of the silly. And then the other part of it is that there's actually a deeper meaning to that, that is an element throughout the book as far as why and how I actually got the name "Silly Daddy". It's the equivalent of the [typical comic book secret] origin type of stuff, like "How did Spider-Man get his powers?" It's something similar to that that involves the oldest of my kids, about how I got the name Silly Daddy. BB: Well, that leads me to ask if you've developed any special powers to go along with the name? JC: You know what? Not yet. But I'm still hoping! [General laughter] I definitely can't say that I'm a wise ol' owl sitting up in a tree. But I do think with experience, and learning from my mistakes, and with the wisdom that comes from above, there's certain things that have been given to me. And this allows me to give back to my kids, and other parents. 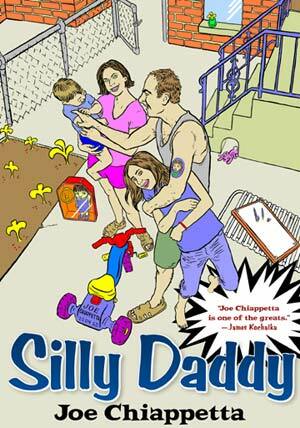 BB: Silly Daddy was originally a series that you self published during the nineties, and then you took a break from publishing and doing shows. What brought you back into the fold, so to speak? JC: It's sort of a long story. I'll tell you the short version; it's kind of unbelievable in itself, as well. Basically, I had been publishing Silly Daddy from about 1990 to about 98. And I had been watching every year, ever since I threw my hat into the self publishing ring, distributors fall off the market one by one -- literally, every year that I was involved. So the market was shrinking, it was getting harder and harder to get exposure, and more stores were closing year after year after year. And even though Silly Daddy was getting international acclaim -- I was getting letters from Paris and all over the place -- the reality of the situation was that the market saturation, and the income level, just wasn't there to sustain a family. So what happened was I basically decided I just was going to stop promoting it, shortly after 98. It was pretty much a conscious decision. I said, "God, it doesn't seems like you really want me to be in this business anymore. So I'm getting out. And if I'm supposed to be in this business again, You're going to have to make it real obvious to me to get back into this again, because it seems like I'm not supposed to be doing this stuff anymore." So I got out, and five years go by. And I was driving down the road one night, and I said what I think was like half a prayer, you know? Because, since an early age, I felt like God has given me a lot of talent, from storytelling to the stuff I come up with, and then the visual skills. And, basically, I said, "God, You sure gave me a lot of talent. And I'm using it to some degree, but not to the degree that you've given me talent. So please do something with all this stuff you've given me." Now, at this point there were about 22 issues of Silly Daddy under my belt, and I'd done a lot of other things throughout the years, and there was a lot of material there. So a week goes by, and, again, this is after a period of five years of not promoting anything. I had made some things, here and there. I just kind of made them, and they just sat around the house. And then my wife gets a call. Denise, who people know from the book since she's a character in it, gets a call, and it's from Reed Press in New York. And the guy at the other end says they want to talk to me because they've been following my work, and they want to publish a big collection, the definitive collection, of Silly Daddy. And there's money involved. There's an advance, there's another advance when it comes out, there's a percentage of the book sales, movie rights, blah blah blah. BB: Now, when you say it's the definitive collection, does that mean that it literally has every Silly Daddy panel and related images under its cover, or is this more of a director's edit, like on a DVD? We now know that, of Leonardo Da Vinci's work, he kept some of his paintings with him, and for much of his life he kept reworking them all the time. When you X-ray them, you see layers and layers of painting. It's kind of like that. Basically, over time, there's things about every story that I had put out that I wish was different; stuff that could have been better, that would have flowed differently if I did this, or I could change the wording if I did this. Continuity-type stuff. So I laid out all the pages of Silly Daddy on the basement floor. You could barely walk around them. And I just kind of looked and picked out some of the stuff that really didn't fit, that wasn't appropriate for telling a continuous story, and that, frankly, was a waste of people's time [in this context]. And we just boiled it down to the essential part of what makes up a parent's life. What makes them tick? What are the victories? What are the failures? What are the sob stories? All that was combined with a new ending, because when I self published the last installment of it, I pretty much had a twelve page text description of what happened to me up to that point. So I took that and adapted it to comic format. So no one's ever really seen that part. BB: You've worked so hard on this project over the years, and shown such an incredible amount of perseverance during that time, even with the break, that I have to wonder what it was that kept you going? Or, to put it another way, what do you get out of creating comics? JC: My answer is dependent upon what year you asked me, because what I get out of it literally has changed, probably every couple of years. When I first started doing Silly Daddy, I really just did it as a means of helping other parents, because some of the things that I did were funny, but avoidable. It would just help out if other parents knew about them, so they could avoid those kind of things. And some of them were not at all funny; in fact, they're pretty grim, but are also things that parents would want to avoid. All were due to my inexperience and lack of wisdom in that area, and I just wanted to share all that with other parents, because it was kind of tugging on my heart, those mistakes that I had made as a father. And so that's how it started. And then, basically, as I kept creating, the more that I would create, the more I would do something that I felt I had just poured everything that I had into it. I pretty much let my blood, if you will, drip right out onto the paper. I put my soul right onto the paper, about what it is to be a father, and what it is to try to give your family everything -- and still come up short. No matter how much effort I put into the book, I would always get done and it'd be nice, and I'd get praise from all sorts of folks and I'd be looking around and thinkin', "Now what?" [General laughter] You know, it was just like, "What was enough?" And I kept doing that, and I kept making what I would consider hit after hit after hit, and then it was like, "Now what?" After every single piece was finished and printed and marketed, it was, "Now what? Now what?" It was like, "Is this ever going to end? Am I always going to keep doing this?" And, finally, I just realized that the reason why I was doing it was because my security was built on sand. I had no stable security. My security was in my performance, and what I was going to do next, and what I was doing then, and it never kept me warm at night. Even though it made me create neat stories, and capture these exciting moments that I did, it didn't keep me warm at night because my security was in relying on myself -- and I'm always going to let myself down. And it stayed that way until I shifted that security, thanks to some neighbors who showed me to rely on the one who made me: Jesus. Then I really started to shift my focus and realize that this isn't what's going to save me. Making this comic isn't going to save me and keep me warm at night. It's just a talent that I have. I'm grateful for the talent, and I'll continue to use it, but it's something that, I know now, doesn't define me. It just happens to be a talent that God has given me, and that I'm grateful for. BB: Anything else you'd like to add before I let you go? JC: Just that I'm really interested to hear what people think of the collection as a whole. So look for it at your comic book shops and book stores. It can also be ordered directly from www.reedpress.com and type in Silly Daddy. www.reedpress.com/books/1-59429-019-9.asp gets you right to the ordering page for the Silly Daddy book. As Joe just noted, to order a copy of Joe's Silly Daddy or any of the other titles offered by Reed Graphica -- wonderful books like Seven Miles a Second, Comanche Moon and David Chelsea in Love, every one of them a true alternative gem saved from the purgatory of "out of print" status by the imprint -- simply head on over to www.reedpress.com/graphica/. 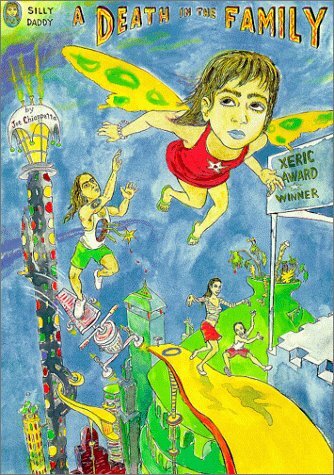 If you'd like to learn a little more about Joe, step on over to www.reedpress.com/authors/jchiappe.asp. Finally, please note that you'll find all of the Reed Graphica books listed under the "Reed Press" heading in the green section of Diamond Comics' Previews catalogue.